Whilst some bathroom trends come and go, traditional designs always have been and always will be popular. The reason for this simple: the classic look and feel of a Victorian (or Edwardian) influenced bathroom is one that practically everybody finds easy to appreciate. Therefore it should come as no surprise that so many people turn to traditional designs whenever they get the urge to give their bathroom a revamp. Certainly, the thought of relaxing in a double-ended bath at the end of a busy day, surrounded by period fittings and evocative accessories can help to make any bather feel like they’ve drifted back to a more decadent and lavish age. So how can a resident go about turning their oh-so-normal bathroom into a classic-looking retreat? There is perhaps nothing more adept at evoking classical style within a bathroom than a supremely stylish freestanding double-ended bath. These stunning items are outstanding choices for traditional bathrooms as they look fantastic and act as an undeniable focal point for the room. Obviously, residents who opt for a freestanding bathtub of this kind will need an exposed wastepipe so it is important that they choose one which will compliment the design of the bath and match the room’s other fittings. Whilst showers aren’t themselves classed as being traditional bathroom items, they are a much needed necessity in today’s world. A shower that has exposed traditional-looking valves with a rigid riser kit is a good choice in a classic bathroom as it will use the exposed metalwork to create a feature which will look suitably elegant in either a shower enclosure or a showering bath. 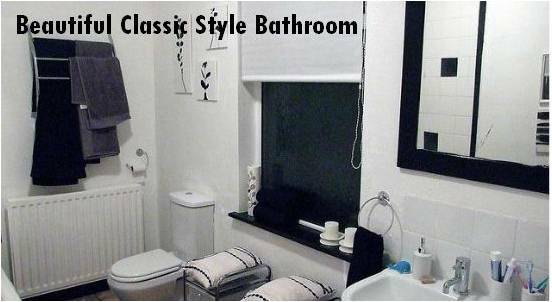 It is often the case that four-piece traditional toilet and basin suites are the best option for achieving a traditional look in UK bathrooms. As well as being cheaper to buy than separates, this option also enables residents to ensure their pottery remains matched. Unsurprisingly, classic-looking heated towel rails are consistently popular heating solutions for those who are looking to re-create the glory days of yesteryear in their bathroom. Indeed, these perennial favourites offer the functionality of chrome ladder towel rails with the traditional look and feel needed to suit a Victorian/Edwardian theme so they really are an outstanding option in all respects. Residents who prefer tiled floors might like to choose large bold square tiles and fit them in a checkerboard pattern to achieve a truly authentic Victorian look. On the other hand, industrious individuals with good quality floorboards could treat or stain their floors to match the bathroom furniture. Utilising decorative wall tiles in feature areas will add the perfect finishing touch to any classic-looking bathroom. ...A good quality wooden toilet seat! This will match any wood finishes in the bathroom and give the room as a whole a truly unique and personal touch!